Back in August of 2018, Unite the People launched a petition to Governor Jerry Brown and the California Department of Corrections and Rehabilitation (CDCR) Secretary asking for nonviolent “third strikers” to be given early parole consideration under California Prop 57. Screenshot from the CDCR inmate locator, showing Prop 57 relief for a UTP client (original consult date of 2025 with a new parole review in 2019). Click to enlarge. 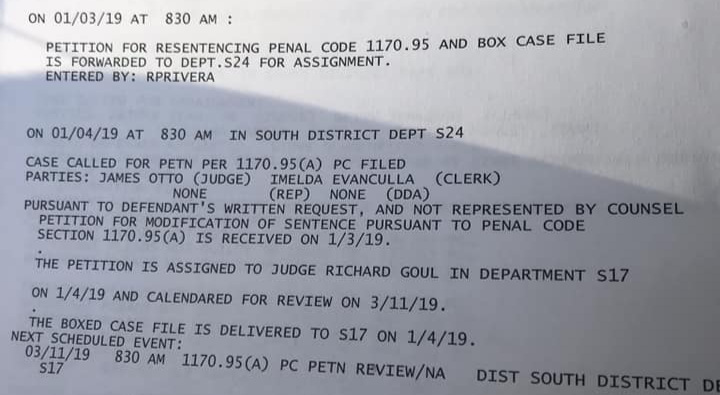 Then, in September, a new court decision granted a petition for Vicenson Edwards (who was imprisoned for a nonviolent third strike), to be given a nonviolent offender parole review under Prop 57. Read more about the Edwards decision here. This decision forced the CDCR to begin drafting new rules to consider early parole for nonviolent inmates locked up under the Three Strikes law. Because Edwards was given a nonviolent offender parole review due to a writ of habeas corpus petition, we hired several attorneys and paralegals and began the process of filing writ of habeas corpus petitions on behalf of many of our supporter’s loved ones. Learn more about habeas corpus petitions here. Now that the new Prop 57 rules have been fully implemented by the CDCR, seventeen of the nonviolent “third strikers” we petitioned for are being considered for early release, with more to come! AB 1812 and AB 2942—We are filing 1170(d)(1) petitions to review and recall unjust sentences. Learn More about 1170(d)(1) petitions here. A Successful SB 1437 Petition Filed by Unite the People. Click to enlarge. SB 1437—We are filing 1170.95(a) petitions to win release for accomplices to a felony murder who did not themselves commit the murder. SB 1437 allows them to be resentenced to the lesser crime and made eligible for earlier release. Learn More. We are excited for those who are now being considered for release under Prop 57 and we will continue to fight for the release of all. To learn more about our legal services, click here. To learn about our upcoming 2020 ballot Proposition in California to free up to 4,000 more nonviolent third strikers—The People’s Fair Sentencing and Public Safety Act—click here.